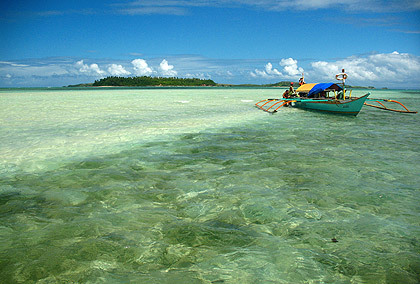 Lahuy Island is located just north of Bikal, a community to the west of Paniman. The Dutch operated a gold mine here in the 16th century before the Spanish came and gave the name Guta de Leche (from where Gota Beach got its name) to Caramoan from the milkdrop stalagmites found in the place. 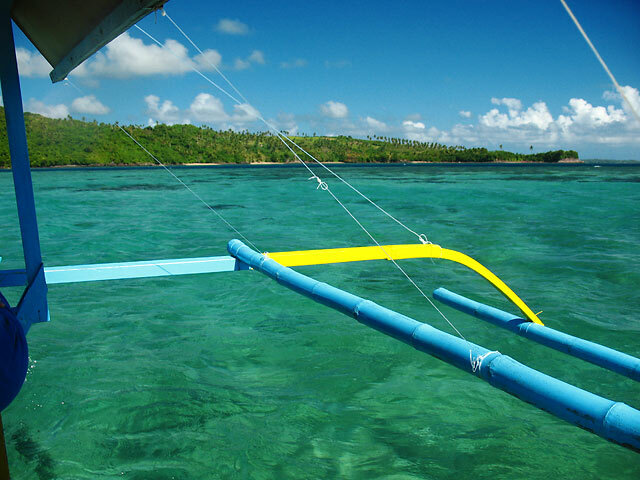 Our outrigger boat took us for a ride along the eastern shores of Lahuy. 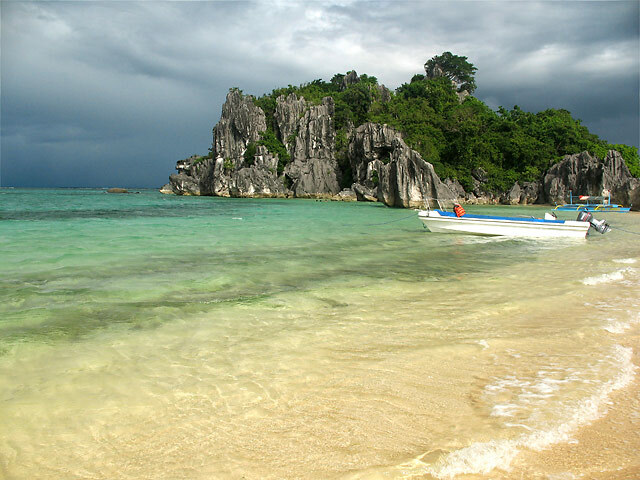 We noted right away the sparklingly shallow turquoise waters and the white sandy beaches along Lahuy’s shores. Here and there we would see groups of flying fish skimming the waves, their silver bodies glistening in the morning sun. Because we started so late in the morning our boat nearly got stuck among the reefs at low tide and our boatmen had to use long bamboo poles to get the boat moving again. 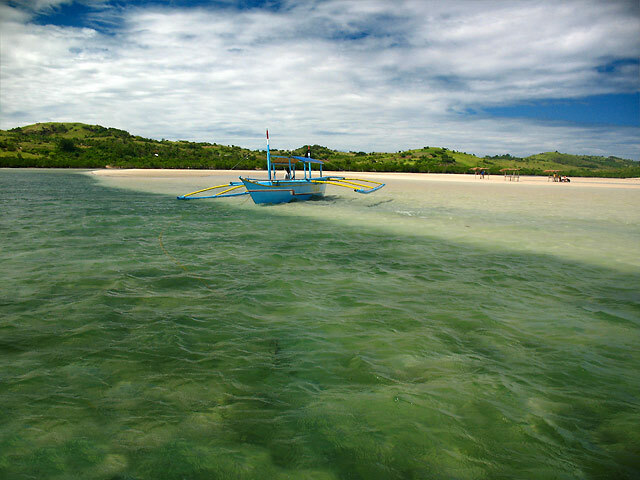 We thought we could just walk to the shore from the boat if needed; so shallow were the waters at that time of day. A tip to all you shoestring travelers: take care to keep to the schedule suggested by the boatmen. The tides here can play havoc with your plans. 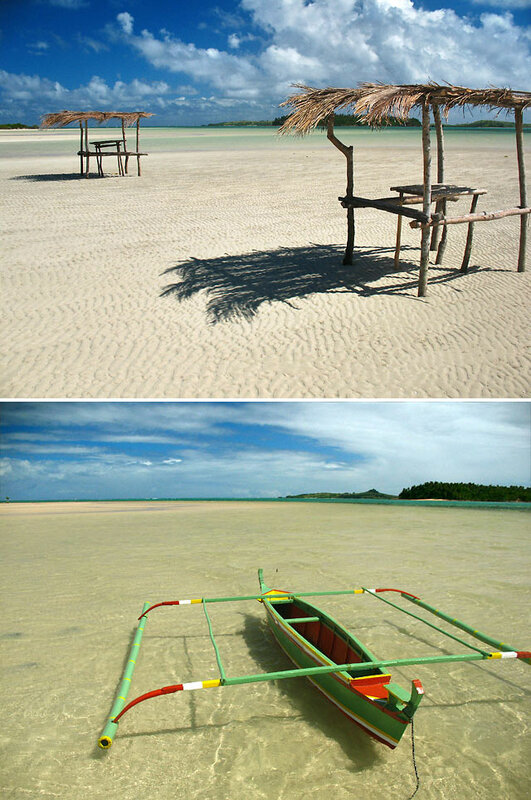 A picture of serenity: the Manlawi sandbar. Manlawi Sandbar. After almost two hours of sailing along the waters off Lahuy we reached the first destination of our second day: the huge sandbar of Manlawi. As our boat slowly glided into the shallow waters of the sandbar we could see it stretching beyond the horizon. 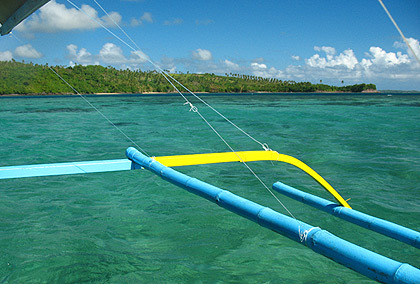 The waters surrounding Manlawi are shallow and crystal-clear. The place exuded a unique feeling of serenity and tranquility and we had it all to ourselves. Boracay has nothing on this place! 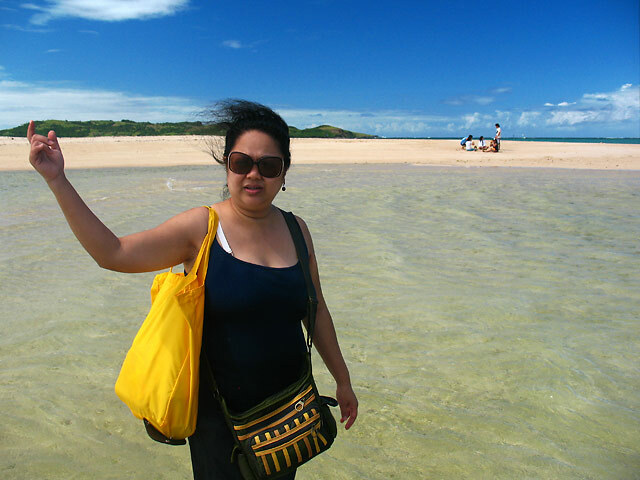 Our friends remarked that all the hassle we went through to get to Caramoan was worth it when they saw Manlawi. There were three small huts in the sandbar – just the perfect place for lunch which our resort had neatly packed for us. We later discovered that had we waited to eat later in the afternoon when the high tide began to submerge a major portion of the sandbar, we would have dined in exotic fashion with the water lapping at our feet. Paradise indeed! A little tip: It’s best to visit Manlawi in the morning when the low tide would have exposed most of the sandbar and to have your lunch on the picnic huts as we did. On a weekday you’ll have a good chance of being the lone visitor but on weekends it’s a different story. Our boatmen said the place can get packed on those days. Cotivas Island. From Manlawi, it was a short ride to our next destination: Cotivas Island. Our boat ride towards Cotivas took us along sparkling turquoise waters that gently changed their hue to jade green as we left Manlawi and entered into deeper waters. Located just east of Manlawi, Cotivas Island has the distinction, for us at least, of possessing the “real” pink sand in Caramoan. The pictures here speak for themselves. 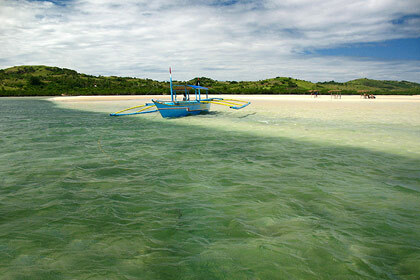 While the sand is not as fine as in other beaches in Caramoan it has a more unique color. 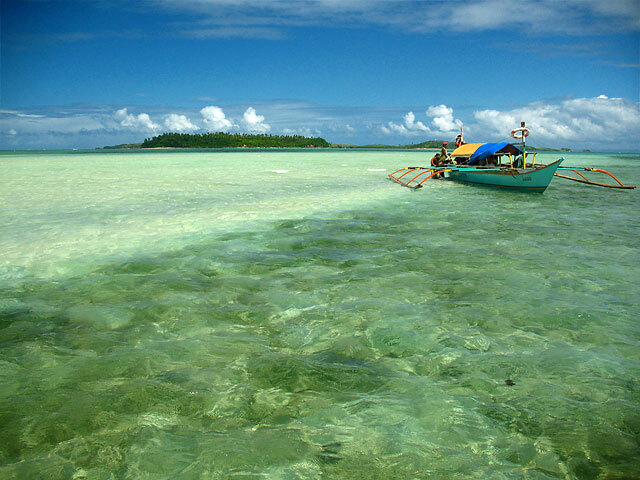 The beach on one side of the island where our boat docked was shallow out to several meters and characterized by gentle waves but on the other side facing the open Philippine Sea, the beach was rocky and the waves were much stronger. Sabitang Laya. Given all the exceptional places in Caramoan, it was hard to select our shoestring traveler favorite but Sabitang Laya on the Balibagan island cluster south of Lahuy, could very well be the one that tops them all. 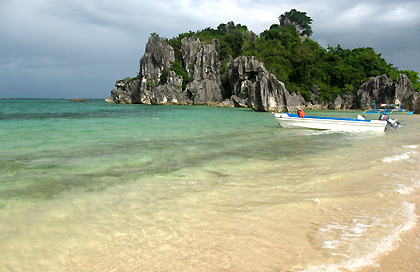 A triangular-shaped island surrounded by creamy-white fine sandy beaches with a cluster of towering limestone rocks at its eastern tip, Sabitang Laya is a combination of the unique and majestic. The sand here is soft like Matukad’s and Leo could not resist laying down on the sand to try to take a short nap. The waters offshore are shallow making them ideal for swimming. There are several spots close to the fortress-like limestone rock cluster that have practically become salt-water swimming pools, with their sandy bottoms devoid of corals and rocks. Sabitang Laya has also become a favorite spot for Survivor. During our visit we chanced upon the crew of Survivor Israel preparing props for their coming shooting. Our timing was good. Had we arrived a few days later we wouldn’t have been allowed to set foot on Sabitang Laya as some friends who visited Caramoan later discovered. Gota Beach, another gorgeous white sand beach framed by majestic limestone karst formations, is where contestants and the production crew of Koh Lanta stayed in 2008. The cabanas built for them further inland at the back of the cove were later developed into a resort. Because the crew of Survivor Israel were preparing for the shooting of their TV series at the time of our visit, the place was off-limits to visitors. Later we got to talk to the owner of the place whose family also owns the resort where we stayed. He mentioned that he bought Gota some time ago knowing that it would later become a prime tourist spot. His premonition was right and the provincial government later leased it from him to construct the resort and to host different Survivor contestants and staff (from France, Serbia, Bulgaria and Israel; we heard that Swedish Survivor producers were also looking at the place). Tayak Cove. This place was supposed to be on our itinerary for the first day but somehow our boatmen had a strange case of amnesia that infected us so we all ended up forgetting about the place. 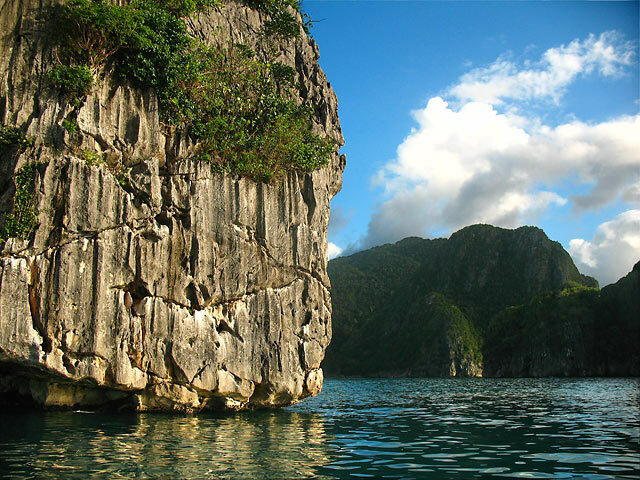 Located on the Caramoan mainland, Tayak is probably not as great as the other places we’ve visited but has towering limestone crags and a hidden, mysterious lagoon further inland. The Grotto in Mt. Caglago. Climb the more than 500 steps to the grotto atop Mt. Caglago (it’s actually a hill) in Tabgon and be rewarded with panoramic views of Caramoan and its surrounding waters and islets. Lantangan Beach, Pitogo Bay. 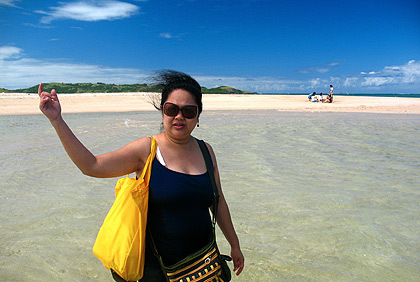 Caramoan’s beaches and coves are not all fine sand. At Lantangan Beach in Pitogo Bay, round pebbles provide a change of scenery. We had wanted to visit Pitogo Bay but when we asked about it, the resort people smiled and said Pitogo was already too far out from Paniman Beach. Not only would it mean more time but the distance equates to more bucks – not a good shoestring traveler option for us. We’ve probably seen it on our boat ride from Sabang to Caramoan so next time around we’ll remember to take note. 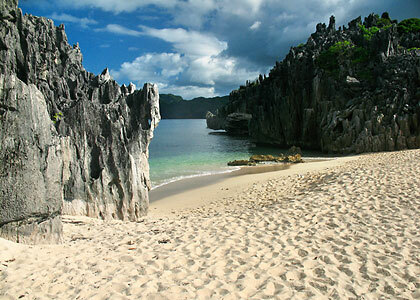 Visit Matukad, Lahos, Gota, Minalahos, Hunongan, Tinago Cove in one trip – they’re located close to each other. Lahuy, Manalawi, Cotivas, Sabitang Laya and the Mt. 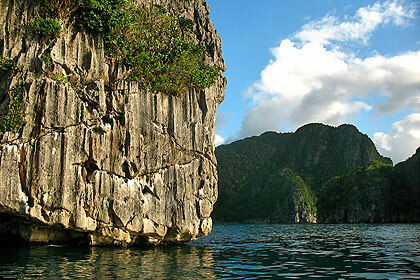 Caglago grotto can all be visited on a separate trip and are bunched up west of Paniman and closer to Bikal. It would be good to find out what the Survivor schedule for shooting is, if any. Friends who went there after us found out that places like Sabitang Laya and Matukad Island (2 of the top places to visit in our opinion) were temporarily off-limits to visitors because they were shooting segments of the reality show in those islands. Caramoan Centro or town proper is just beginning to feel the impact of tourism so the place still has a rustic feel to it with very little nightlife. Several new accommodations are beginning to be built, however, and several roads leading to Centro were being concreted when we arrived in February 2010. BY AIR: Philippine Airlines and Cebu Pacific have round trip flights to Naga City and are not so expensive (about P1,000+ one-way as of this writing) if you book early. Travel time is 45 minutes to an hour. If you have a private vehicle it is possible to travel all the way to Sabang Pier and to leave your car in any of the pay parking lots near the pier. Or you can get really adventurous and try to drive by land all the way to Caramoan town but be sure you have a four-wheel drive vehicle and a sturdy back. If you’re traveling by air, the next step is to get to the Naga city Bus Terminal from the airport (near SM). However, if you’re traveling by bus from Manila, the bus takes you directly to this terminal. At the terminal take a jeep or van bound for Sabang Pier. The resort we got in Caramoan had arranged for a van to pick up our group at the terminal and take us to Sabang so it was much more convenient for us. If you’re staying at a resort in Caramoan they might be able to arrange a similar pick-up for you which should be reasonably priced if you’re traveling as part of a group. At Sabang Pier take the big motorized boats to Guijalo Port in Caramoan town. Each boat can usually take 50 people on a single trip. Departure schedules for Caramoan were at 7, 9 and 11 AM and 2 PM when we went there. If you happen to take the boat during low tide you will have to allow the local guys to carry you on their shoulder for a fee – just another part of the adventure that is Caramoan’s. The ride to Guijalo port usually takes about two hours and can sometimes take passengers through rough waves. 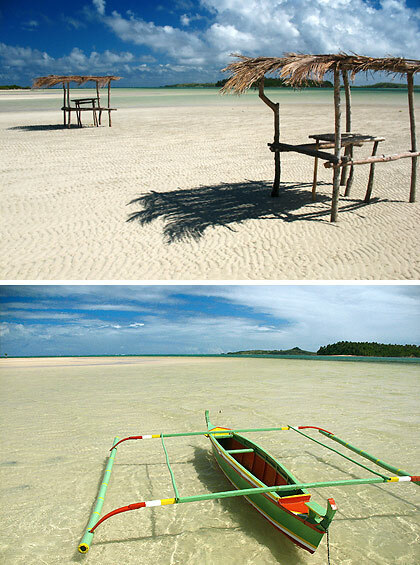 From the port take a tricycle to Caramoan Centro (the town proper) or to your place of stay. Again our resort came to our rescue by providing a jeepney to take us from the port. Back to Caramoan Part 1.